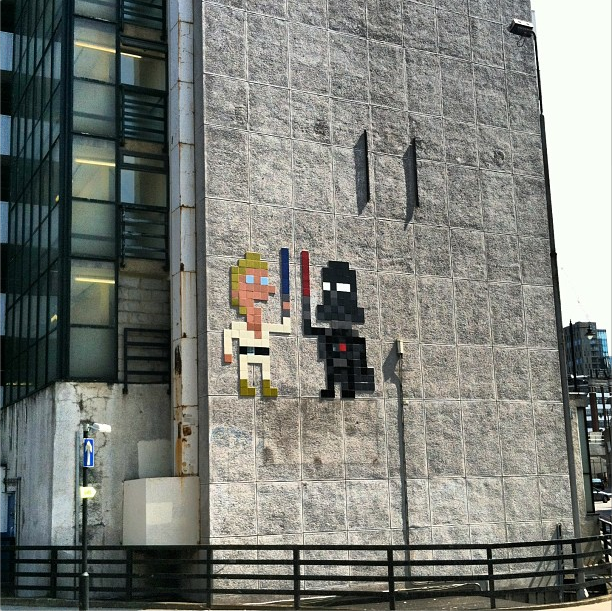 iotacons: Star Wars iotacon Street Art by Invader! Star Wars iotacon Street Art by Invader! This amazing mosaic, which is the largest iotacon fan art I know of, was put up on an east London car park by Invader, the mosaic street artist featured in the Banksy film Exit Through the Gift Shop. Thanks Invader! There are tons of photos of this all over the internet. I wish more of them gave credit to me as the designer, or mentioned the blog, but this is very exciting and fun anyway. Now I've got to go see this thing in person before the owner of the Car Park figures out a way to get it off! I don't know if Invader did give official credit to you or did ask for your permission before using your Artwork, but I can assure you that I've first heard about your work in his blog, where he shared some of his pictures about London Invasion, and where I found your name in between Tags related to this picture! Anyway, I wanted to tell you that I really like your work and I wish if you make some joined artworks with Invader!